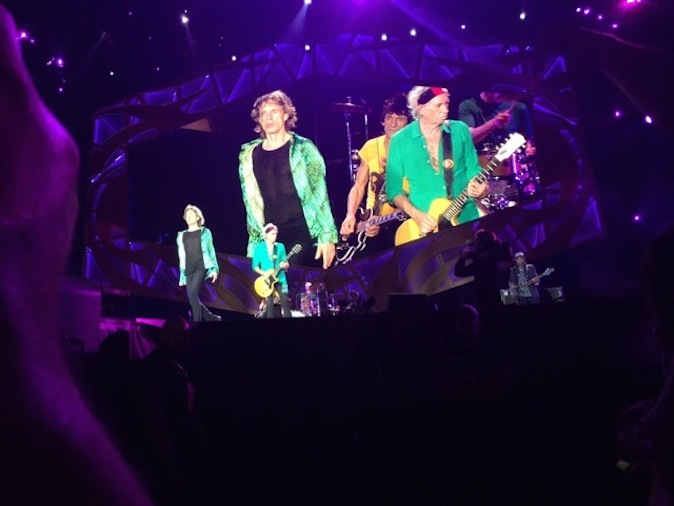 Rome’s Circus Maximus is the perfect venue for the greatest show on earth – the Rolling Stones, larger than life! The Stones are like one giant family who roll together, and this time we rolled with them, black vans dashing from hotels, through barricaded streets, into back entrances and heavily guarded areas well before the ‘concerto’. The guys were surprising chilled, I think they’ve done it before – I was actually the nervous one, the build up was extraordinary! The main men: Keith, relaxed, quiet, but a force. Charlie, light, divine, sharp wit. Ronnie, a legend, the technical whizz, the elf. Mick, absolute focus and other worldly presence. The set up is huge, technicians, musicians, security, all running everywhere. The stage set, perfect for a venue that is more than half a kilometre long, the band were blown up on huge screens to be 70-80 feet tall….epic! As for the concert – extraordinary! The sound great, the energy incredible. The Romans had been entering Circus Maximus since about lunch time. The Stones came on at 9.50pm, as scheduled, opening with Jumping Jack Flash a light and pyrotechnics show. Mick was absolutely in control the whole time, so many of those wild gestures signaling tweaks to pace, volume, balance; he’s the conductor, the pied piper and everyone follows. Keith, a true showman positively loves being up there. Ronnie, the glue between all of them, played perfectly. Charlie nails the drums – and looks so smooth. The back-up singers, Lisa and Bernard, holy cow! Tic Tac on the Sax, the bass player used to play for Miles Davis so I’m told. The odd performance by Mick Taylor, still like a Jedi on his Strat. During Brown Sugar (pre-encore), we were whisked off, back to the vans and out of there with the grande famiglia. What a night. After a few night caps to wind down, it was off to bed. Today we’re back chilling in Puglia. The Four Winds Music Festival in 1991, an initiative of the charming seaside town of Bermagui, not far from Bega on South Coast NSW. A biannual event, it went from strength to the point where today it’s safe to say it has come of age. I was down there last weekend, so decided to take a look. At the free, opening performance the audience of locals as well as visitors from Sydney and interstate gathered on the Fisheman’s Wharf of Bermagui port, while classical, indigenous, European and Asian dancers, singers and musicians performed on a boat. It set the international, interdenominational tone of the program, and immediately stamped it with a very special South Coast identity. Highlights of the weekend included Italian cellist Giovani Sollima’s rendition of his Concerto Rotondo, totally awe-inspring. Pianist Dejan Lazic’ Mozart Quintet for Piano and Winds, spine-tingling. And both men along with the Artistic Director of the Australian Chamber Orchestra, Richard Tognetti in discussion with Margaret ‘the voice’ Throsby about their definitions – and demonstrations – of the Credenza, was sheer genius – fun, informative, finessed. May the Four Winds blow! DANISH ROYALS HELP CELEBRATE OPERA HOUSE! What amazing night it was, gathered at the ‘skirts’ of the Opera House with a few thousand of Sydney’s glitterati (and the Danish Royal Family) to officially ring in the 40th anniversary of the greatest Australian icon. It was so moving to hear the speakers evoke the pride – in a nation, in a culture, in a practice, in a family – that Jørn Utzon’s masterpiece incarnates. The Utzon family feel like our own, and they were in attendance to celebrate a very grand member of theirs. Jørn’s son, Jan Utzon who worked closely alongside his father until his death in 2008 gave a rousing speech, addressing the Opera House as he would a member of his clan. “Since your conception you have dominated our lives.” he said. And I am proud to know that she will always be a part of mine.